For Baltimore's Bicentennial, to celebrate 200 years of Baltimore history, BAS members designed and appliquéd their own Baltimore memories into blocks creating the Baltimore Bicentennial Quilt. 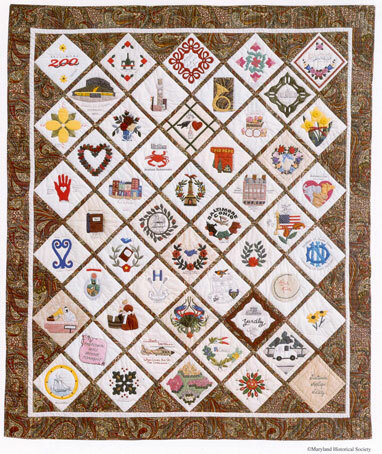 This quilt provides twentieth-century stories of Baltimore, just as the mid nineteenth-century album quilts recorded events of their time. 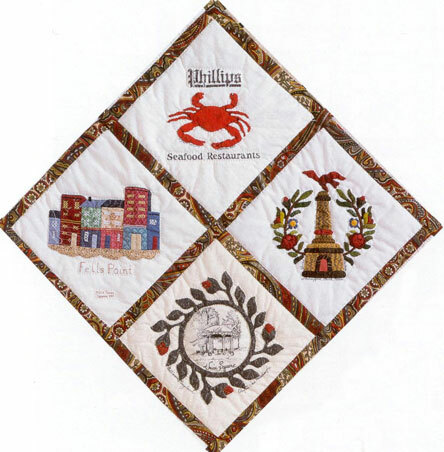 This quilt was hung in various public buildings in downtown Baltimore and Annapolis for one year, and then was donated to the Maryland Historical Society for their quilt collection in 1999. Baltimore's Monument to George Washington at Mount Vernon Place on Charles Street is depicted in one block, and in another, Memorial Stadium reminds us where the Baltimore Colts and Baltimore Orioles made sports history. Other historic Baltimore landmarks appear, such as the Bromo Seltzer Tower, Carroll Mansion, Union Square, Institute of Notre Dame, and the Joseph Meyerhoff Symphony Hall. Baltimore Symphony Orchestra is represented by musical notes floating from a French Horn. The early steam engine "Tom Thumb" is shown in one block, and the Baltimore and Ohio Railroad is represented in another. The famous writer, Edgar Allan Poe (whose grave is in Baltimore) is remembered with a raven, a tell-tale heart, and a partial bottle of cognac. Interspersed with beautiful floral blocks are symbols of contemporary Baltimore: McCormick Spice Company, Yardley, and the historic waterside tourist area of Fells Point. Even some animals appear from Baltimore Zoo. Popular restaurants such as Tio Pepe and Phillips Seafood are illustrated. The Chesapeake Bay blue crab, a popular Maryland seafood specialty, appears in two blocks, one showing its natural blue and green colors, the other steamed (probably with Old Bay Seasoning!). Several stitchers made blocks to tell what makes Baltimore special to them: the Shock Trauma helicopter ("When Lives are on the Line"), Baltimore's clipper ship, the "Pride of Baltimore", Babe Ruth's baseball, the annual Spring Flower Mart, and Peppermint Stick Lemons. You can almost hear the bells of the summertime Sno-Ball vendor pictured in one block. Even Pigtown is represented. "Pigtown will Shine Tonight!"